Thanksgiving is right around the corner and as we are getting our fridges ready for the all the food that we have to prepare for the day, we must also get our homes ready to host all the family and friends for that special day. As the people of Puyallup are shopping for their turkeys, cranberries and potatoes, they should remember that the presentation is just as important as the food that graces the table. There are so many amazingly simple ways to decorate your home with fun, festive and beautiful fall items that will create the perfect ambiance for your guests. Decorating for Thanksgiving does not have to be overly complicated. Rolling up your sleeves for a little DIY can not only save you money but can also be a fun family activity to do with your children. Here are some stress-free DIY projects and a few easy decorating tips for home during this joyful and warm holiday. Incorporating the red, golds, and yellows of fall leaves into your Thanksgiving décor is not only inexpensive but is the perfect way to capture the essence of the fall season. 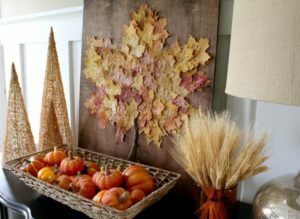 This DIY décor project requires about 50 fall leaves, a small stick, a large piece of wood in a square shape, some hot glue, and some Mod Podge. Before starting the project, make sure to dry the leaves out for at least a few days using wax paper. They will stick better to the board when dry. Using a black sharpie, draw the outline of a large leaf on the board. This outline will provide a guide for where to place the leaves. Using a little bit of hot glue, glue each leaf to the board. Once you have completed the giant leaf, glue the stick to the bottom. For some extra pizzazz, use the Mod Podge on the leaves and sprinkle different colors of glitter on the leaves. Use glitter colors like gold, red and orange to really make the giant leaf really eye-catching. Pumpkins are n’t just for Halloween, there are many creative ways to decorate with pumpkins for Thanksgiving. However, instead of using regular orange pumpkins, opt for the white pumpkins for a modern version of a classic. 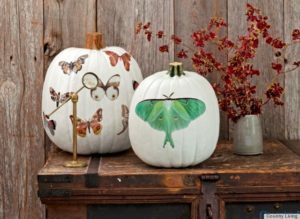 Using Mod Podge, decoupage a white pumpkin with pressed leaves. Turn this project into a fun family activity by getting out for a fall hike on any one of the wonderful Puyallup trails to gather leaves. Get creative with the types of leaves that you use, grab different shapes and colors of leaves. 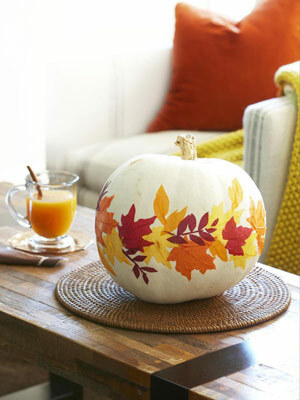 Another easy way to decorate a white pumpkin is with vinyl decals. Wilson Graphics sells some inexpensive vinyl decals that are perfect for the pumpkins. Using the Woodland Creatures decals like the Fawn with Flowers or the Owl with Flowers are perfect for decorating a fal l pumpkin. Use a foam brush to cover each pumpkin with two coats of acrylic paint. Let the pumpkins dry for at least 30 minutes before applying the decals. You can also create a more elegant pumpkin by using black lace. Purchase different patterns of lace from any fabric store. Pick a contrasting color like a sage green or silver to paint the pumpkin. Cut the lace in a way that follows the existing pattern. Once the paint on the pumpkin dries, brush Mod Podge on the pumpkin and adhere the lace pieces to the pumpkin. Finish off the project with coating the lace with another layer of Mod Podge. Thanksgiving is a lovely time of year where we gather with our family and friends and give thanks to all the wonderful things in our life. A reminder of those things can be incorporated into a creative holiday decoration. 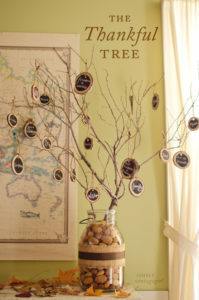 A Thankful Tree is a Thanksgiving decoration that gives your guests reasons why they should be thankful all year long. Assembly for the tree requires sticks with multiple branches, wooden chalkboard tags, chalk, scissors, a glass jar, assorted nuts or decorative rocks, and burlap and a ribbon. On each of the wooden chalkboard tags, write the specific thing that you are thankful for like family, friends, health and food. Use a hot glue on the strip of burlap to glue the ribbon to it. Once that dries, glue it to the glass jar. Fill the jar with the assorted nuts or decorative rocks. Arrange the sticks in the glass jar so they are spaced evenly apart. The nuts or rocks should keep the sticks upright and in place. Hang the wooden tags from individual branches. Your guests will appreciate the reminders of what to be thankful in their lives. Wreaths just aren’t for Christ mas. There are many ways to use decorative wreaths to add a special touch to your home during this holiday. There are a few budget friendly ways to create the perfect wreath that will a nice addition to your Thanksgiving décor. 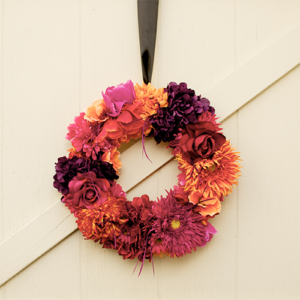 A wreath of silk fall-hued flowers on your door is a great way to invite guests into your home. Starting with a foam wreath and a black ribbon, tie the ribbon around the wreath so you will be able to hang it up. Cut the heads of the silk flowers and glue them to the wreath. Choose fall-hued flowers like deep reds, magentas and oranges. Make sure to push the stem of the flower into the foam as well. Tightly pack the flowers together on the foam so there is no foam that shows through. Once the glue has dried you can hang the wreath on your door. Decorating for Thanksgiving is the best way to kick off the holiday season. Turn decorating into a family activity and focus on DIY projects that your children can help with and participate in. Creating crafts is the perfect family activity and Thanksgiving is the time to bond with family. Give thanks this year for all your family and close friends. We would love to hear what you are thankful for this Thanksgiving. Make sure to tweet us and let us know!